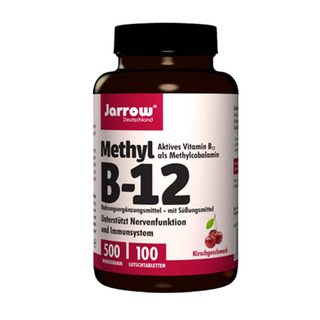 JARROW® Methyl B-12 500 µg is a vegan B12-dietary supplement that is admitted in Germany since 2011. 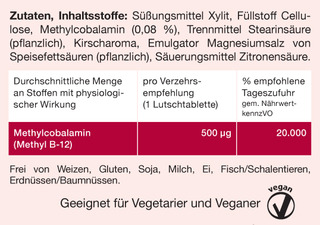 Each tablet has a cherry taste and contains 500 µg vitamin B12 (Methylcobalamin). Because of the lower dose these tablets are suitable for children, too. Directions:We don't know about any reliable study telling us how much methylcobalamin to take per day. 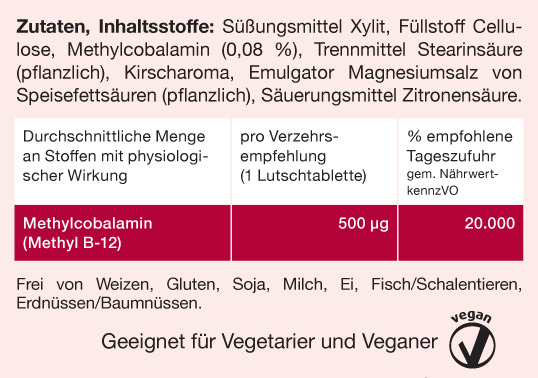 Our own experience is that 1 tablet per day is sufficient to cover your body's need of 2-3 µg cobalamin per day. But there're also other opinions: Jack Norris recommends the intake of 1.000-2.000 µg per day (2-4 tablets). The methylcobalamin contained by JARROW® Methyl-B12 is the biologically active form of the coenzyme of Vitamin B12. Compared to cyanocobalamin, it can be used by your body immediately, without having to transform it into the biologically active coenzyme B12. Therefore methylcobalamin has a higher bioavailability. The tablets do not contain iodine! Hence they are suitable for anyone suffering from thyroid disease. JARROW® recommends these tablets for children. But please consult a healthcare professional before you give dietary supplements to children. The recommended daily dose is far less! GMO-free. The maltodextrin contained in the lemon flavor comes from potatoes that are not genetically modified. Xylitol, lemon flavor, citric acid, Methylcobalamin (0,08 %), stearic acid (vegetable source), magnesium stearate (vegetable source), cellulose. Contains no wheat, gluten, soy, milk, eggs, fish/shell fish, peanuts/walnuts.